Few things grab our attention like a mid-summer thunderstorm. Steamy temperatures and turbulent atmospheric conditions often conspire to produce amazing visual pyrotechnics and house-shaking booms. Thunderstorms occur when cold upper air descends and warm, moist air rises. When these air masses collide, they form thick cumulonimbus clouds, often referred to as “thunderheads.” Thunderstorms may begin and end in an instant, or several storms may string together to make thunder and lighting clusters. While thunderstorms can occur during any time of the year, they’re more likely to occur in spring and summer. According to a NASA study, the most intense and powerful thunderstorms occur in the eastern part of the Andes mountains in Argentina. But strong thunderstorms can occur just about anywhere moisture, unstable air and lift (from sea breezes or mountains) causes air to rise up. Thunderstorms have the potential to cause significant damage and injuries, most notably from lightning strikes. It’s always wise to seek shelter during a thunderstorm so you are protected from lightning, falling limbs from trees and hail, which often accompanies thunderstorms. Despite thunderstorms’ harmful potential, they can be very enjoyable to watch or chase. But storm spectators should keep these tips in mind. 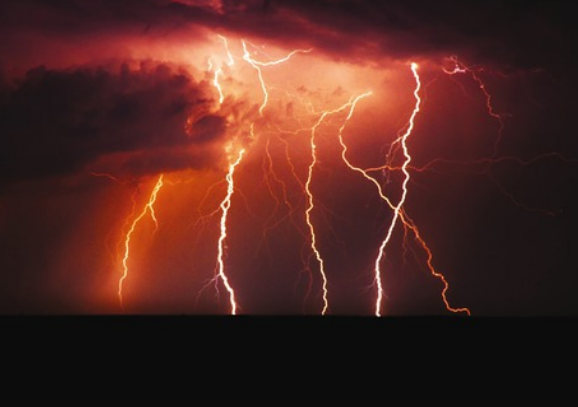 · Watch thunderstorms from the safety of indoors. It may be tempting to be out in the storm, but if you head outside during a storm, you are risking injury or even death. Consider watching a storm from the comfort of inside a garage, where you can leave the door open and see, hear and smell the storm while it comes through. · Keep flashlights or candles handy. Strong storms can knock out power. Always have a backup light source readily available in case the power goes out. Also, you may need a battery-powered radio or a charged mobile phone at the ready to keep up on storm alerts. · Keep pets in an interior room so they do not get too spooked. Thunderstorms frighten many animals, so pets should not share in your storm-watching endeavors. They may injure themselves trying to escape the noise. It’s best if pets are kept in a quiet, dark space until the storm has ended. · Steer clear of standing bodies of water. Downed power lines may leach electricity through puddles, potentially causing electrocution if people are standing in puddles. Do not touch any wires that seem suspicious. Water is an easy conduit for lightning, so avoid any bodies of water during a thunderstorm. · If you’re caught in a thunderstorm and don’t have indoor shelter, do not seek shelter under trees, which can attract lightning strikes. Accuweather.com advises that people who cannot find reasonable shelter after a storm should take steps to minimize their risk of being struck or injured. Crouch as low to the ground as you can, but do not lie down on the ground or put your hands down. Stay on just your feet to cover as little ground as possible. You also want to be as low as you can to reduce your risks of being a lightning target. Keep anything that is a good electrical conductor away from you. Summer weather is bound to include some thunderstorms. Where there is thunder, there’s lightning, and remember to stay safe by watching these storms from a distance and making smart choices.